A two-stroke (or two-cycle) engine is a type of internal combustion engine which completes a power cycle with two strokes (up and down movements) of the piston during only one crankshaft revolution. 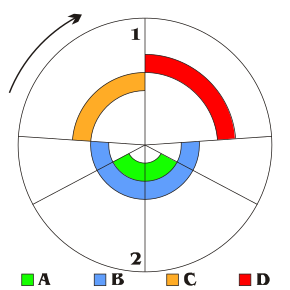 This is in contrast to a "four-stroke engine", which requires four strokes of the piston to complete a power cycle during two crankshaft revolutions. In a two-stroke engine, the end of the combustion stroke and the beginning of the compression stroke happen simultaneously, with the intake and exhaust (or scavenging) functions occurring at the same time. Two-stroke engines often have a high power-to-weight ratio, power being available in a narrow range of rotational speeds called the "power band". Compared to four-stroke engines, two-stroke engines have a greatly reduced number of moving parts, and so can be more compact and significantly lighter. The first commercial two-stroke engine involving in-cylinder compression is attributed to Scottish engineer Dugald Clerk, who patented his design in 1881. However, unlike most later two-stroke engines, his had a separate charging cylinder. The crankcase-scavenged engine, employing the area below the piston as a charging pump, is generally credited to Englishman Joseph Day. On 31 December 1878, German inventor Karl Benz produced a two-stroke gas engine, for which he received a patent in 1879 in Germany. The first truly practical two-stroke engine is attributed to Yorkshireman Alfred Angas Scott, who started producing twin-cylinder water-cooled motorcycles in 1908. Gasoline (spark ignition) versions are particularly useful in lightweight or portable applications such as chainsaws and motorcycles. However, when weight and size are not an issue, the cycle's potential for high thermodynamic efficiency makes it ideal for diesel compression ignition engines operating in large, weight-insensitive applications, such as marine propulsion, railway locomotives and electricity generation. In a two-stroke engine, the heat transfer from the engine to the cooling system is less than in a four-stroke, which means that two-stroke engines can be more efficient. Crankcase-compression two-stroke engines, such as common small gasoline-powered engines, create more exhaust emissions than four-stroke engines of comparable power output because their two-stroke oil (petroil) lubrication mixture is also burned in the engine, due to the engine's total-loss oiling system, and because the combined opening time of the intake and exhaust ports in some 2-stroke designs can allow some amount of unburned fuel vapors to exit in the exhaust stream. Two-stroke petrol engines are preferred when mechanical simplicity, light weight, and high power-to-weight ratio are design priorities. With the traditional lubrication technique of mixing oil into the fuel, they also have the advantage of working in any orientation, as there is no oil reservoir dependent on gravity; this is an essential property for hand-held power tools such as chainsaws. A number of mainstream automobile manufacturers have used two-stroke engines in the past, including the Swedish Saab and German manufacturers DKW, Auto-Union, VEB Sachsenring Automobilwerke Zwickau, and VEB Automobilwerk Eisenach. The Japanese manufacturer Suzuki did the same in the 1970s. Production of two-stroke cars ended in the 1980s in the West, due to increasingly stringent regulation of air pollution. Eastern Bloc countries continued until around 1991, with the Trabant and Wartburg in East Germany. 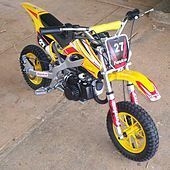 Two-stroke engines are still found in a variety of small propulsion applications, such as outboard motors, high-performance, small-capacity motorcycles, mopeds, and dirt bikes, underbones, scooters, tuk-tuks, snowmobiles, karts, ultralight airplanes, and model airplanes and other model vehicles. They are also common in power tools used outdoors, such as lawn mowers, chainsaws, and weed-wackers. With direct fuel injection and a sump-based lubrication system, a two-stroke engine produces air pollution no worse than a four-stroke, and it can achieve higher thermodynamic efficiency. Therefore, the cycle has historically also been used in large diesel engines, mostly large industrial and marine engines, as well as some trucks and heavy machinery. There are several experimental designs intended for automobile use: for instance, Lotus of Norfolk, UK, had in 2008 a prototype direct-injection two-stroke engine intended for alcohol fuels called the Omnivore which it is demonstrating in a version of the Exige. A two-stroke engine, in this case with an expansion chamber illustrates the effect of a reflected pressure wave on the fuel charge. This is important for maximum charge pressure (volumetric efficiency) and fuel economy. It is used on most high-performance engine designs. Although the principles remain the same, the mechanical details of various two-stroke engines differ depending on the type. The design types vary according to the method of introducing the charge to the cylinder, the method of scavenging the cylinder (exchanging burnt exhaust for fresh mixture) and the method of exhausting the cylinder. Piston port is the simplest of the designs and the most common in small two-stroke engines. All functions are controlled solely by the piston covering and uncovering the ports as it moves up and down in the cylinder. In the 1970s, Yamaha worked out some basic principles for this system. They found that, in general, widening an exhaust port increases the power by the same amount as raising the port, but the power band does not narrow as it does when the port is raised. However, there is a mechanical limit to the width of a single exhaust port, at about 62% of the bore diameter for reasonable ring life. Beyond this, the rings will bulge into the exhaust port and wear quickly. A maximum 70% of bore width is possible in racing engines, where rings are changed every few races. Intake duration is between 120 and 160 degrees. Transfer port time is set at a minimum of 26 degrees. The strong low pressure pulse of a racing two-stroke expansion chamber can drop the pressure to -7 PSI when the piston is at bottom dead center, and the transfer ports nearly wide open. One of the reasons for high fuel consumption in two-strokes is that some of the incoming pressurized fuel-air mixture is forced across the top of the piston, where it has a cooling action, and straight out the exhaust pipe. An expansion chamber with a strong reverse pulse will stop this out-going flow. A fundamental difference from typical four-stroke engines is that the two-stroke's crankcase is sealed and forms part of the induction process in gasoline and hot bulb engines. Diesel two-strokes often add a Roots blower or piston pump for scavenging. A Cox Babe Bee 0.049 cubic inch (0.8 cubic cm) reed valve engine, disassembled, uses glow plug ignition. The mass is 64 grams. The reed valve is a simple but highly effective form of check valve commonly fitted in the intake tract of the piston-controlled port. They allow asymmetric intake of the fuel charge, improving power and economy, while widening the power band. They are widely used in motorcycle, ATV and marine outboard engines. The intake pathway is opened and closed by a rotating member. A familiar type sometimes seen on small motorcycles is a slotted disk attached to the crankshaft which covers and uncovers an opening in the end of the crankcase, allowing charge to enter during one portion of the cycle (aka disc valve). Another form of rotary inlet valve used on two-stroke engines employs two cylindrical members with suitable cutouts arranged to rotate one within the other - the inlet pipe having passage to the crankcase only when the two cutouts coincide. The crankshaft itself may form one of the members, as in most glow plug model engines. In another embodiment, the crank disc is arranged to be a close-clearance fit in the crankcase, and is provided with a cutout which lines up with an inlet passage in the crankcase wall at the appropriate time, as in Vespa motor scooters. The advantage of a rotary valve is that it enables the two-stroke engine's intake timing to be asymmetrical, which is not possible with piston-port type engines. The piston-port type engine's intake timing opens and closes before and after top dead center at the same crank angle, making it symmetrical, whereas the rotary valve allows the opening to begin and close earlier. Rotary valve engines can be tailored to deliver power over a wider speed range or higher power over a narrower speed range than either piston port or reed valve engine. Where a portion of the rotary valve is a portion of the crankcase itself, it is particularly important that no wear is allowed to take place. In a cross-flow engine, the transfer and exhaust ports are on opposite sides of the cylinder, and a deflector on the top of the piston directs the fresh intake charge into the upper part of the cylinder, pushing the residual exhaust gas down the other side of the deflector and out the exhaust port. The deflector increases the piston's weight and exposed surface area, affecting piston cooling and also making it difficult to achieve an efficient combustion chamber shape. This design has been superseded since the 1960s by the loop scavenging method (below), especially for motorbikes, although for smaller or slower engines, such as lawn mowers, the cross-flow-scavenged design can be an acceptable approach. This method of scavenging uses carefully shaped and positioned transfer ports to direct the flow of fresh mixture toward the combustion chamber as it enters the cylinder. The fuel/air mixture strikes the cylinder head, then follows the curvature of the combustion chamber, and then is deflected downward. This not only prevents the fuel/air mixture from traveling directly out the exhaust port, but also creates a swirling turbulence which improves combustion efficiency, power and economy. Usually, a piston deflector is not required, so this approach has a distinct advantage over the cross-flow scheme (above). Often referred to as "Schnuerle" (or "Schnürle") loop scavenging after Adolf Schnürle, the German inventor of an early form in the mid-1920s, it became widely adopted in that country during the 1930s and spread further afield after World War II. Loop scavenging is the most common type of fuel/air mixture transfer used on modern two-stroke engines. Suzuki was one of the first manufacturers outside of Europe to adopt loop-scavenged two-stroke engines. This operational feature was used in conjunction with the expansion chamber exhaust developed by German motorcycle manufacturer, MZ and Walter Kaaden. Loop scavenging, disc valves and expansion chambers worked in a highly coordinated way to significantly increase the power output of two-stroke engines, particularly from the Japanese manufacturers Suzuki, Yamaha and Kawasaki. Suzuki and Yamaha enjoyed success in grand Prix motorcycle racing in the 1960s due in no small way to the increased power afforded by loop scavenging. An additional benefit of loop scavenging was the piston could be made nearly flat or slightly dome shaped, which allowed the piston to be appreciably lighter and stronger, and consequently to tolerate higher engine speeds. The "flat top" piston also has better thermal properties and is less prone to uneven heating, expansion, piston seizures, dimensional changes and compression losses. SAAB built 750 and 850 cc 3-cylinder engines based on a DKW design that proved reasonably successful employing loop charging. The original SAAB 92 had a two-cylinder engine of comparatively low efficiency. At cruising speed, reflected wave exhaust port blocking occurred at too low a frequency. Using the asymmetric three-port exhaust manifold employed in the identical DKW engine improved fuel economy. The 750 cc standard engine produced 36 to 42 hp, depending on the model year. The Monte Carlo Rally variant, 750 cc (with a filled crankshaft for higher base compression), generated 65 hp. An 850 cc version was available in the 1966 SAAB Sport (a standard trim model in comparison to the deluxe trim of the Monte Carlo). Base compression comprises a portion of the overall compression ratio of a two-stroke engine. Work published at SAE in 2012 points that loop scavenging is under every circumstance more efficient than cross-flow scavenging. In a uniflow engine, the mixture, or "charge air" in the case of a diesel, enters at one end of the cylinder controlled by the piston and the exhaust exits at the other end controlled by an exhaust valve or piston. The scavenging gas-flow is therefore in one direction only, hence the name uniflow. 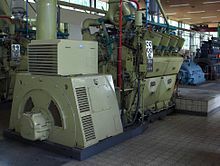 The valved arrangement is common in on-road, off-road and stationary two-stroke engines (Detroit Diesel), certain small marine two-stroke engines (Gray Marine), certain railroad two-stroke diesel locomotives (Electro-Motive Diesel) and large marine two-stroke main propulsion engines (Wärtsilä). Ported types are represented by the opposed piston design in which there are two pistons in each cylinder, working in opposite directions such as the Junkers Jumo 205 and Napier Deltic. The once-popular split-single design falls into this class, being effectively a folded uniflow. With advanced angle exhaust timing, uniflow engines can be supercharged with a crankshaft-driven (piston or Roots) blower. The piston of this engine is "top-hat" shaped; the upper section forms the regular cylinder, and the lower section performs a scavenging function. The units run in pairs, with the lower half of one piston charging an adjacent combustion chamber. This system is still partially dependent on total loss lubrication (for the upper part of the piston), the other parts being sump lubricated with cleanliness and reliability benefits. The piston weight is only about 20% heavier than a loop-scavenged piston because skirt thicknesses can be less. Bernard Hooper Engineering Ltd. (BHE) is one of the more recent engine developers using this approach. Many modern two-stroke engines employ a power valve system. The valves are normally in or around the exhaust ports. They work in one of two ways: either they alter the exhaust port by closing off the top part of the port, which alters port timing, such as Rotax R.A.V.E, Yamaha YPVS, Honda RC-Valve, Kawasaki K.I.P.S., Cagiva C.T.S. or Suzuki AETC systems, or by altering the volume of the exhaust, which changes the resonant frequency of the expansion chamber, such as the Suzuki SAEC and Honda V-TACS system. The result is an engine with better low-speed power without sacrificing high-speed power. However, as power valves are in the hot gas flow they need regular maintenance to perform well. Direct injection has considerable advantages in two-stroke engines, eliminating some of the waste and pollution caused by carbureted two-strokes where a proportion of the fuel/air mixture entering the cylinder goes directly out, unburned, through the exhaust port. Two systems are in use, low-pressure air-assisted injection, and high pressure injection. Since the fuel does not pass through the crankcase, a separate source of lubrication is needed. Diesel engines rely solely on the heat of compression for ignition. In the case of Schnuerle ported and loop-scavenged engines, intake and exhaust happens via piston-controlled ports. A uniflow diesel engine takes in air via scavenge ports, and exhaust gases exit through an overhead poppet valve. Two-stroke diesels are all scavenged by forced induction. Some designs use a mechanically driven Roots blower, whilst marine diesel engines normally use exhaust-driven turbochargers, with electrically driven auxiliary blowers for low-speed operation when exhaust turbochargers are unable to deliver enough air. Marine two-stroke diesel engines directly coupled to the propeller are able to start and run in either direction as required. The fuel injection and valve timing is mechanically readjusted by using a different set of cams on the camshaft. Thus, the engine can be run in reverse to move the vessel backwards. Most small petrol two-stroke engines cannot be lubricated by oil contained in their crankcase and sump, since the crankcase is being used to pump fuel-air mixture into the cylinder. Over a short period, the constant stream of fuel-air mixture would carry away the lubricating oil into the combustion chamber while thinning the remainder with condensing petrol. Traditionally, the moving parts (both rotating crankshaft and sliding piston) were instead lubricated by a premixed fuel-oil mixture (at a ratio between 16:1 and 100:1). As late as the 1970s, petrol stations would often have a separate pump to deliver such a premix fuel to motorcycles. Even then, in many cases, the rider would carry a bottle of their own two-stroke oil. Two-stroke oils which became available worldwide in the 1970s are specifically designed to mix with petrol and be burnt in the combustion chamber without leaving undue unburnt oil or ash. This led to a marked reduction in spark plug fouling, which had previously been a factor in two-stroke engines. All two-stroke engines running on a petrol/oil mix will suffer oil starvation if forced to rotate at speed with the throttle closed, e.g. motorcycles descending long hills and perhaps when decelerating gradually from high speed by changing down through the gears. Two-stroke cars (such as those that were popular in Eastern Europe in the mid-20th century) were in particular danger and were usually fitted with freewheel mechanisms in the powertrain, allowing the engine to idle when the throttle was closed, requiring the use of the brakes in all slowing situations. Large two-stroke engines, including diesels, normally use a sump lubrication system similar to four-stroke engines. The cylinder must still be pressurized, but this is not done from the crankcase, but by an ancillary Roots-type blower or a specialized turbocharger (usually a turbo-compressor system) which has a "locked" compressor for starting (and during which it is powered by the engine's crankshaft), but which is "unlocked" for running (and during which it is powered by the engine's exhaust gases flowing through the turbine). For the purpose of this discussion, it is convenient to think in motorcycle terms, where the exhaust pipe faces into the cooling air stream, and the crankshaft commonly spins in the same axis and direction as do the wheels i.e. "forward". Some of the considerations discussed here apply to four-stroke engines (which cannot reverse their direction of rotation without considerable modification), almost all of which spin forward, too. Regular gasoline two-stroke engines will run backwards for short periods and under light load with little problem, and this has been used to provide a reversing facility in microcars, such as the Messerschmitt KR200, that lacked reverse gearing. Where the vehicle has electric starting, the motor will be turned off and restarted backwards by turning the key in the opposite direction. Two-stroke golf carts have used a similar kind of system. Traditional flywheel magnetos (using contact-breaker points, but no external coil) worked equally well in reverse because the cam controlling the points is symmetrical, breaking contact before top dead center (TDC) equally well whether running forwards or backwards. Reed-valve engines will run backwards just as well as piston-controlled porting, though rotary valve engines have asymmetrical inlet timing and will not run very well. There are serious disadvantages to running many engines backwards under load for any length of time, and some of these reasons are general, applying equally to both two-stroke and four-stroke engines. This disadvantage is accepted in most cases where cost, weight and size are major considerations. 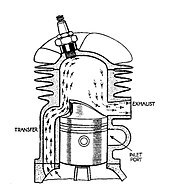 The problem comes about because in "forwards" running the major thrust face of the piston is on the back face of the cylinder which, in a two-stroke particularly, is the coolest and best-lubricated part. The forward face of the piston in a trunk engine is less well-suited to be the major thrust face since it covers and uncovers the exhaust port in the cylinder, the hottest part of the engine, where piston lubrication is at its most marginal. The front face of the piston is also more vulnerable since the exhaust port, the largest in the engine, is in the front wall of the cylinder. Piston skirts and rings risk being extruded into this port, so it is always better to have them pressing hardest on the opposite wall (where there are only the transfer ports in a crossflow engine) and there is good support. In some engines, the small end is offset to reduce thrust in the intended rotational direction and the forward face of the piston has been made thinner and lighter to compensate; but when running backwards, this weaker forward face suffers increased mechanical stress it was not designed to resist. This can be avoided by the use of crossheads and also using thrust bearings to isolate the engine from end loads. Large two-stroke ship diesels are sometimes made to be reversible. Like four-stroke ship engines (some of which are also reversible) they use mechanically operated valves, so require additional camshaft mechanisms. These engines use crossheads to eliminate sidethrust on the piston and isolate the under-piston space from the crankcase. On top of other considerations, the oil-pump of a modern two-stroke may not work in reverse, in which case the engine will suffer oil starvation within a short time. Running a motorcycle engine backwards is relatively easy to initiate, and in rare cases, can be triggered by a back-fire. It is not advisable. Model airplane engines with reed-valves can be mounted in either tractor or pusher configuration without needing to change the propeller. These motors are compression ignition, so there are no ignition timing issues and little difference between running forward and running backward. ^ Clew, Jeff (2004). The Scott Motorcycle: The Yowling Two-Stroke. Haynes Publishing. p. 240. ISBN 0854291644. ^ "Suzuki LJ50 INFO". Lj10.com. Retrieved 2010-11-07. ^ US EPA, OAR (16 August 2016). "Vehicles and Engines". US EPA. ^ "Lotus, QUB and Jaguar to Develop Variable Compression Ratio, 2-Stroke OMNIVORE Research Engine". Green Car Congress. 2008-08-12. Retrieved 2010-11-07. ^ "Lotus Engineering Omnivore Variable Compression Ratio Engine to Debut in Geneva". Wot.motortrend.com. Retrieved 2010-11-07. ^ Korzeniewski, Jeremy (2008-08-12). "Lotus developing efficient two-stroke OMNIVORE engine". Autoblog. Retrieved 2010-11-07. ^ Irving, P.E. (1967). Two-Stroke Power Units. Newnes. pp. 13–15. ^ Junkers truck engine 1933. ^ "About Two Stroke Oils and Premixes". Retrieved 2016-08-21. G Bickle et al. (ICT Co), R Domesle et al. (Degussa AG): "Controlling Two-Stroke Engine Emissions", Automotive Engineering International (SAE) Feb 2000:27-32. BOSCH, "Automotive Manual", 2005, Section: Fluid's Mechanics, Table 'Discharge from High-Pressure Deposits'. Sherman, Don (December 17, 2009), "A Two-Stroke Revival, Without the Blue Haze", New York Times . This page was last edited on 1 February 2019, at 20:14 (UTC).